On December 1, 2011, I was interviewed by AnashaWana on her Inspirations Expressed internet radio show. AnashaWana is pure Love and Joy herself. She was a great interviewer! 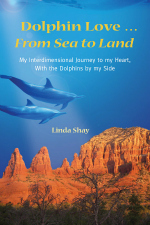 During the show, she suggested that I read the part in my book where I was invited by a pod of spirit dolphins to become one of their ambassadors on land, and to do dolphin energy healing as my career. The reading describes the magical and synchronistic events that unfolded afterwards, and the moment I said “Yes” to this mysterious journey, even though I wasn’t at all sure just what I was saying “yes” to! That moment in my 7-year journey with the dolphins was really the turning point that changed my life, and my life’s purpose, forever. It’s a fun listen. I hope you enJOY it! On November 11, 2011, I was blessed to present a Dolphin Energy Joyshop to a Manna Reiki group, who were gathered in Sedona to receive the first-ever second Manna Reiki Attunement from my new friend and spirit sister, Samarah Leia. The moment I entered Samarah’s home the afternoon of 11/11/11, all present were already radiating so much Love and Joy, it was easy for the dolphins and me to swim into their field and share the Love, Joy, and Playfulness of the dolphins! Dolphin Love was newly published, and I took the opportunity to read one of my favorite parts to them. I read from Chapter 20 – Grandfather. This is a beautiful story of how I met, and entered into deep relationship with, an elder bottlenose dolphin and his pod who reside off the coast of Bonaire, in the south Caribbean. It’s a magical story that was amazing to share, in person, with such a receptive pod of beautiful humans! EnJOY!